The combination of futuristic space technology and high fantasy has of course been done before. 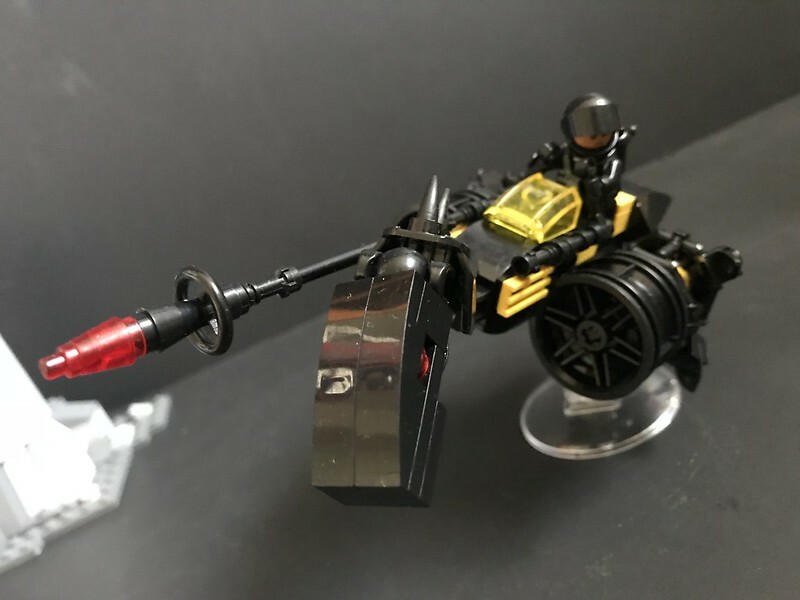 LEGO has its own slightly cringeworthy Nexo Knights, but even the Star Wars franchise is effectively high fantasy in a tech setting, with its Sith and Jedi wizards and its fighter pilot knights. 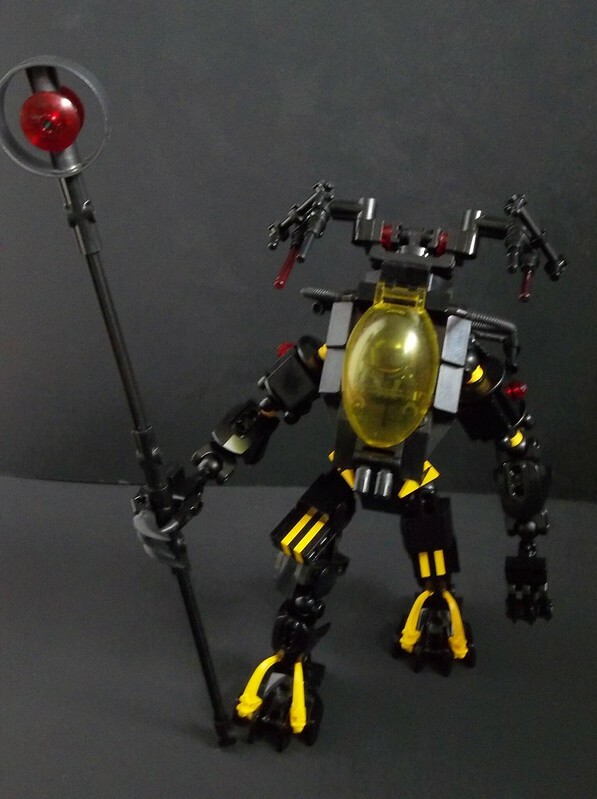 I didn’t think much of Nexo Knights’ execution, but the concept is sound. 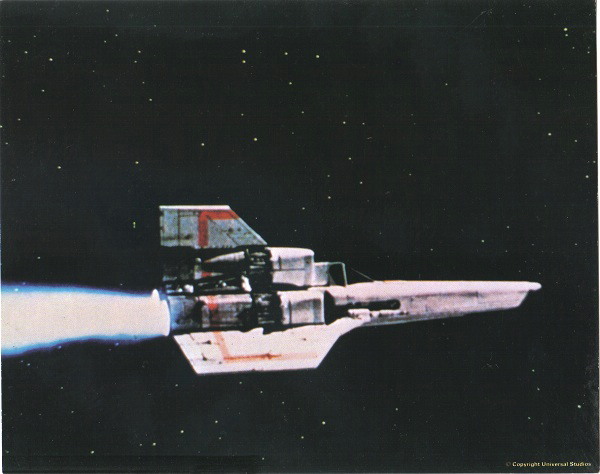 And because it’s me, the high technology in question has a better-than-average chance of having something to do with the Classic Space/Blacktron metatheme. 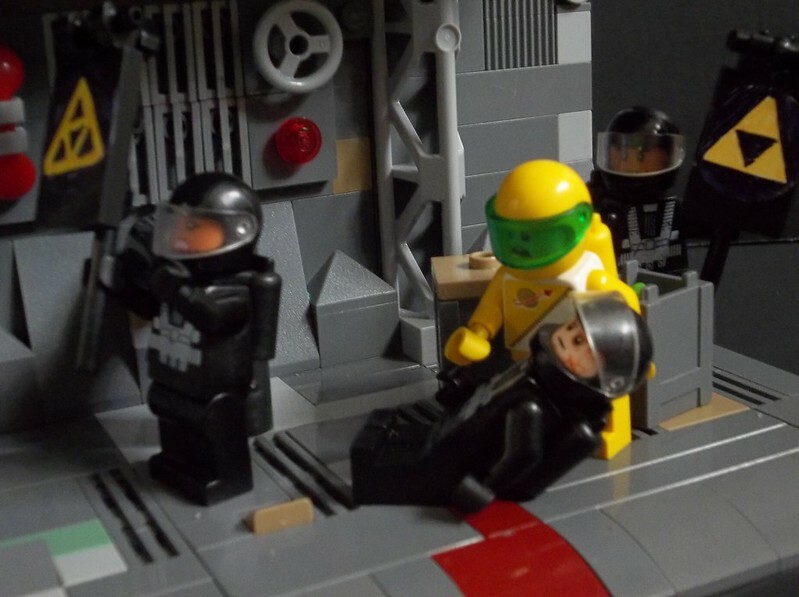 In this case, I’ve perhaps subconsciously channelled my flipped Brightly Coloured Tyranny take on the original LEGO Space universe, because the knight is a Blacktron and the draconoid (“draco” + “mechanoid”) is in NCS colours. 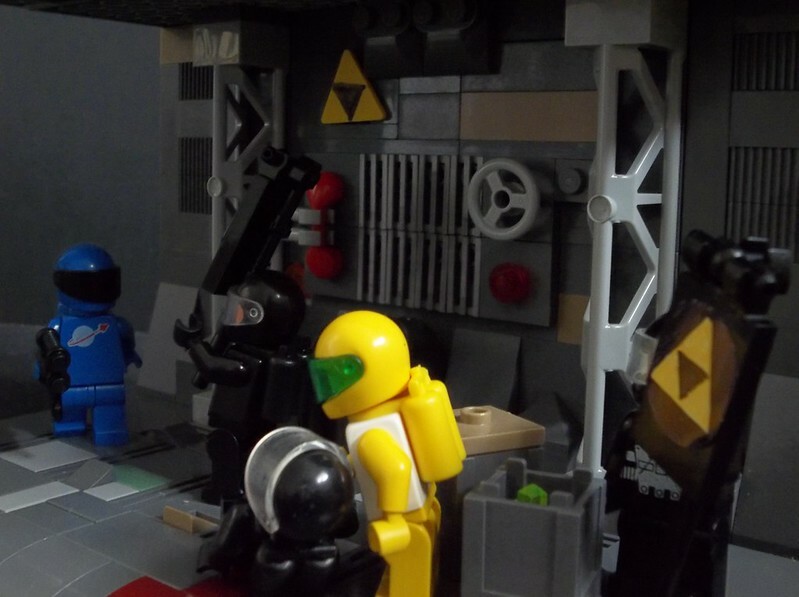 But building a Black(tron) Knight references the Classic Castle prototheme’s original bad guy as well as the Classic Space universe’s primary adversaries. 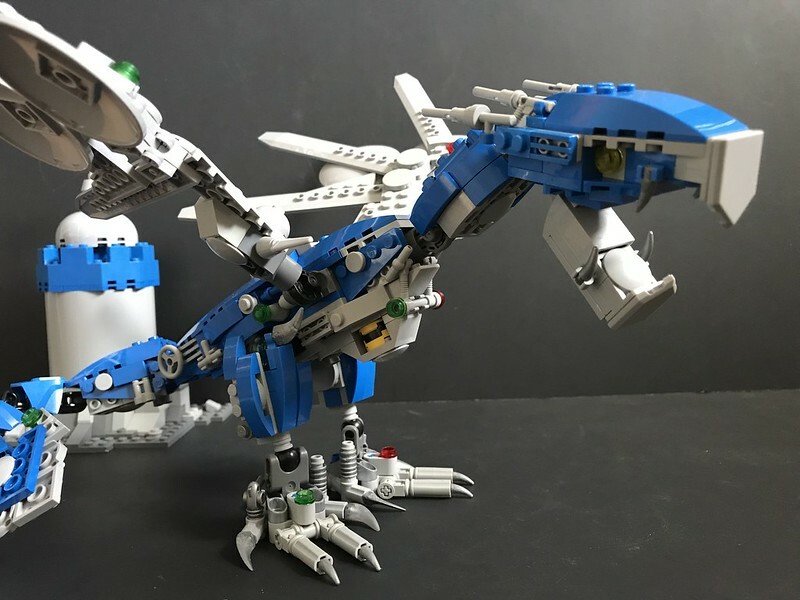 I’ve wanted to build an updated Neoclassic Space dragon for several months now but not been inspired as to specifics. My original Elemental Dragon of Classic Space was in some ways a markedly different build: more of a blended hybrid between spaceship and creature. 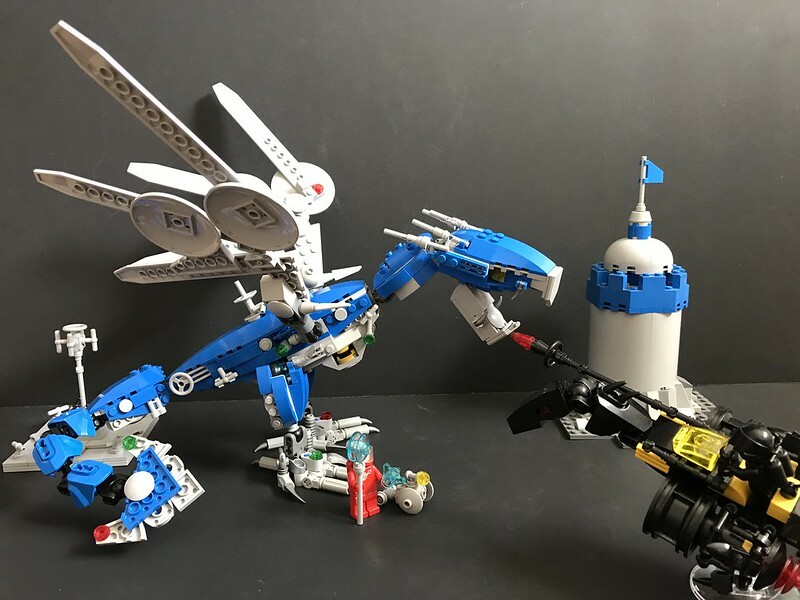 This Classic Space dragon being a robotic creature, it skips out on some of the Elemental Dragon’s features, like cockpit and thrusters and the like. The difference is mostly that the previous dragon was an Elemental Dragon of the “Element” of Classic Space. 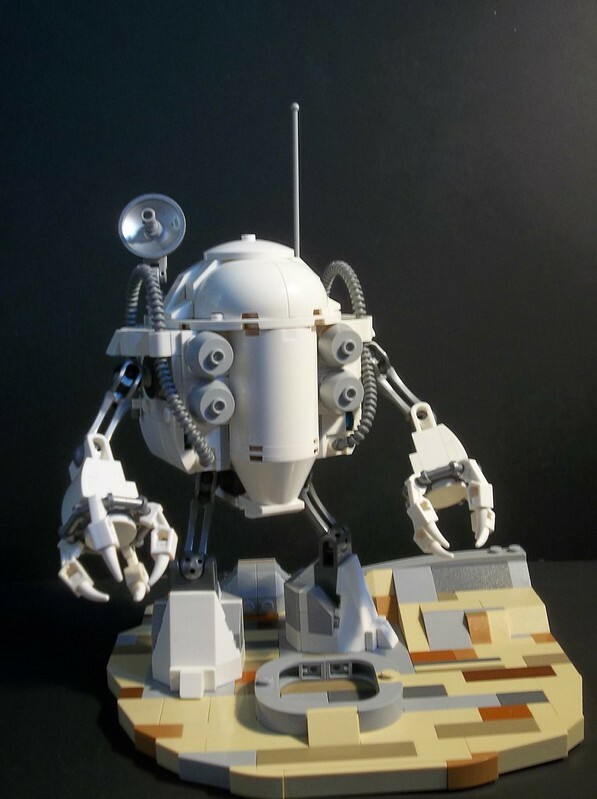 In view of the weird stuff considered “elements” by the various LEGO themes – lightning, ice (as well as water), sound, mind, amber, love – having an element of Classic Space is not something I consider much of a stretch, but that’s beside the point for this creation. This dragon was created in order to serve as an adversary for the Black(tron) Knight. 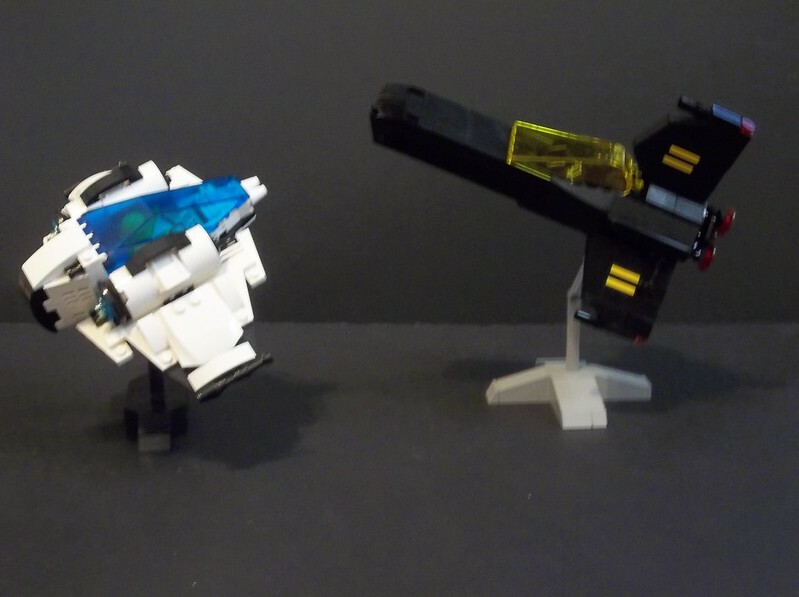 The hover horses were one of the few bits of Nexo Knights that I thought were well thought out and well designed. So I decided to make my own version of a mostly horse-shaped speeder; bigger and hopefully more impressive than the Nexo hoversteed. 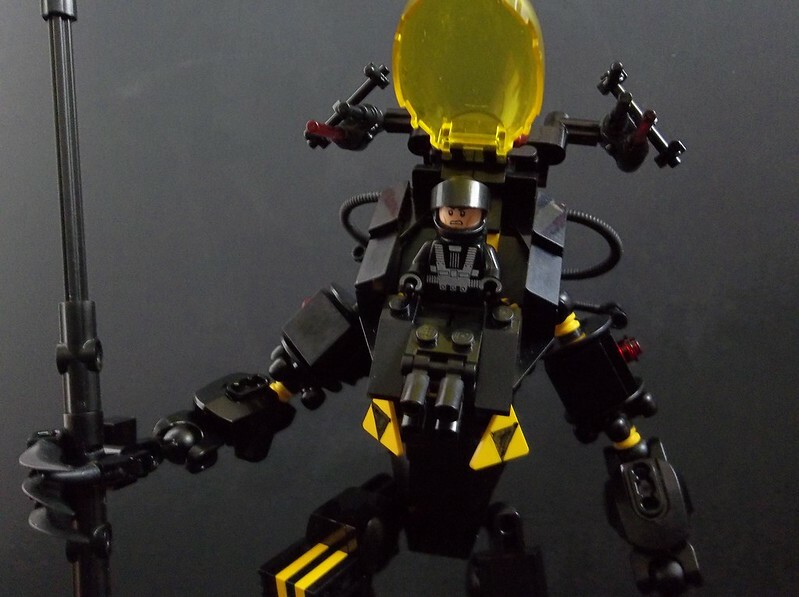 I went Blacktron initially because of the colours of my CCBS elements, but the idea of a Black Knight that’s a Blacktron seemed like a good one. And that meant either a Neoclassic Space or Neo-Futuron dragon, unless I built a second grav-destrier and generated a joust. I still might; a Neo-Futuron grav-destrier is more probable with my element inventory, or possibly a Neo-Space Police I version. Until then, the Black(tron) Knight is fighting an NCS dragon and red-spacesuited technomancer. 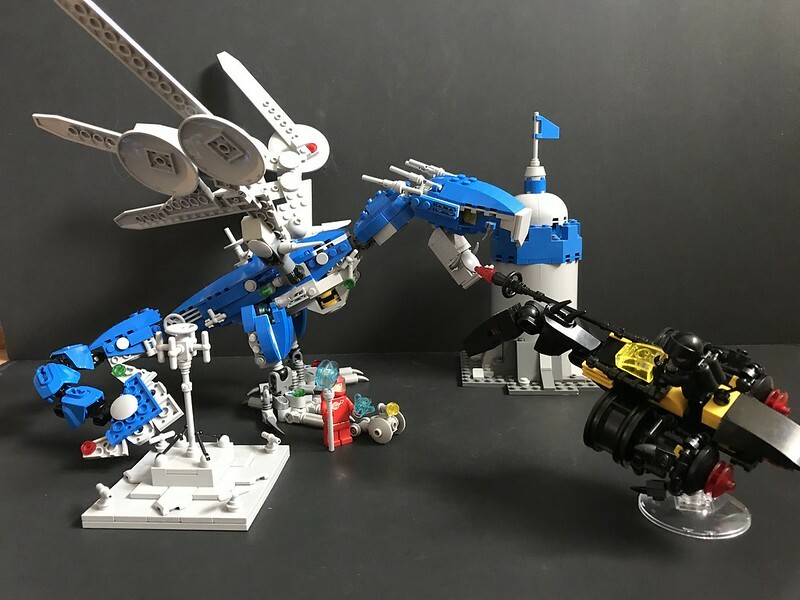 This entry was posted in Blacktron, Dragons, Fantasy, Lego Classic Space, Lego Space, Mechs, Speeders and tagged Blacktron, Dragon, Lego, Lego Castle, MOC, Neoclassic Space on October 17, 2018 by geoffhorswood. 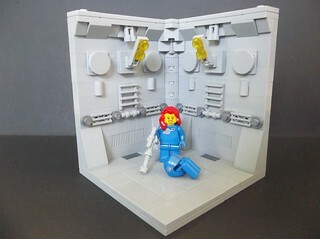 Even awful Steve Miller Band songs can occasionally inspire a LEGO creation. I know “The Joker” is a very popular song from its era, but it’s never really scratched where I itch, personally. 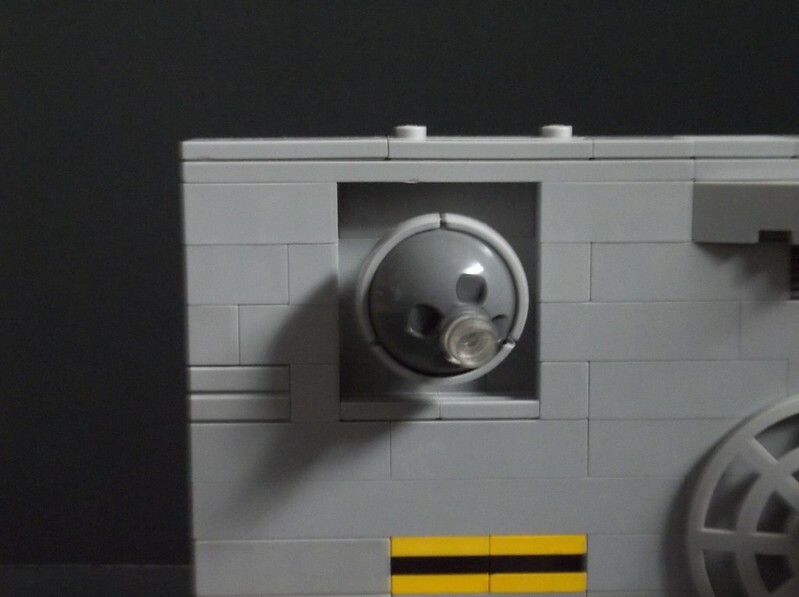 But when the first line came on the radio as I drove to my LEGO User Group meeting, I started thinking about the possibilities. 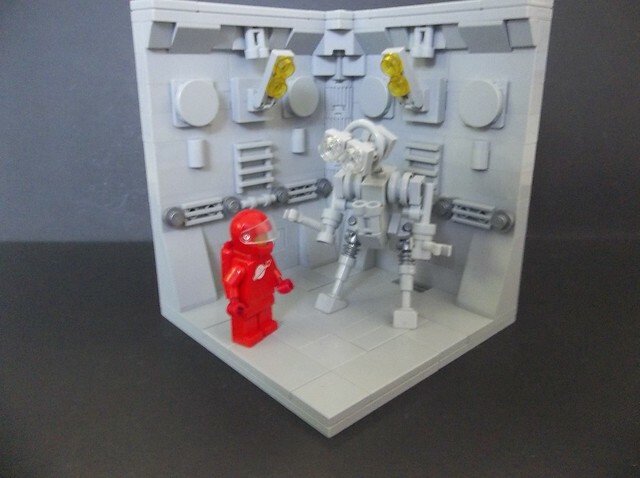 My personal builders’ rallying call is something along the lines of “Space Everything”, so… space cowboys. Literally. As an Englishman living in Texas, I’m surrounded by cowboy culture. The Fort Worth stock show and rodeo. People who wear cowboy boots. People who wear stetsons. Everybody and his brother’s cousin’s dog in their stupid pickup trucks. People who actually own cattle – in the Dallas-Fort Worth metropolitan area, which is one of the larger urban conglomerates in the entire US. The whole Western genre. The entire Country music scene. Now, there are a few good Country songs, and I enjoy the occasional Western, but really, the entire cultural landscape is as alien as HG Wells’ Martians tramping through the English countryside. There are two basic ways of dealing with the alienness: assimilation or resistance. Either you assimilate and learn cowboy, at least culturally speaking, or you return to your cultural roots and become a sort of professional Englishman. 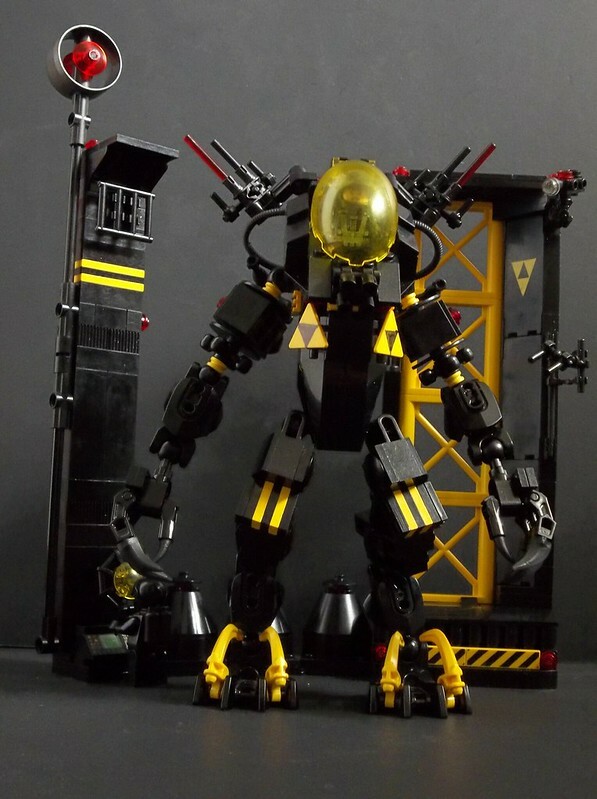 A creation like this could be taken as either the product of a final blended assimilation of worlds, or a sort of ironic joke on the whole subculture. In actuality it’s something of both. 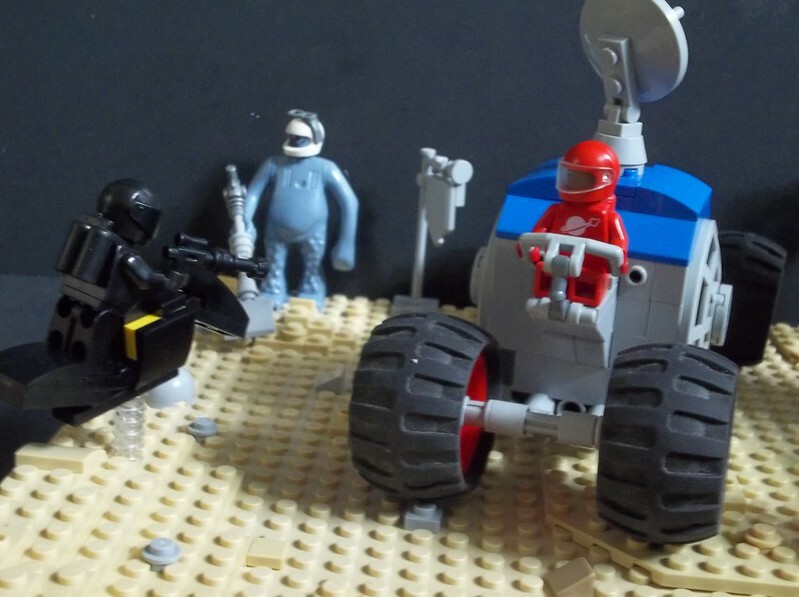 Merging different genres is something I do, and usually results in an interesting creation, but there’s a certain amount of visual irony involved in the Blacktron vs Space Police shootout, the rover shaped a bit like a stagecoach and the robot cactus. And the horse-shaped antigravity speeders tethered outside the saloon. 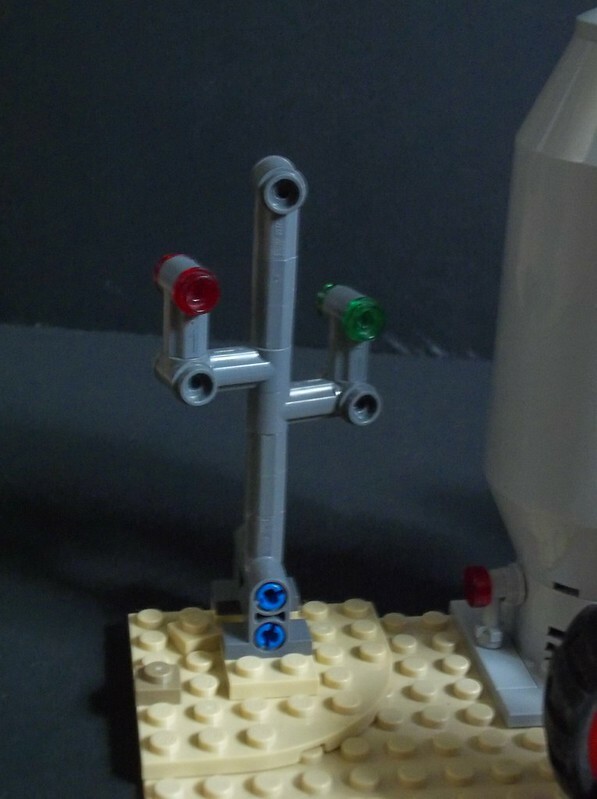 Robot cactus. Because no Western scene is complete without a Saguaro. Using my two tan baseplates for what I think is the first time (my kids use baseplates a lot more than I do), I started out with the saloon and then expanded it into the stagecoach area. 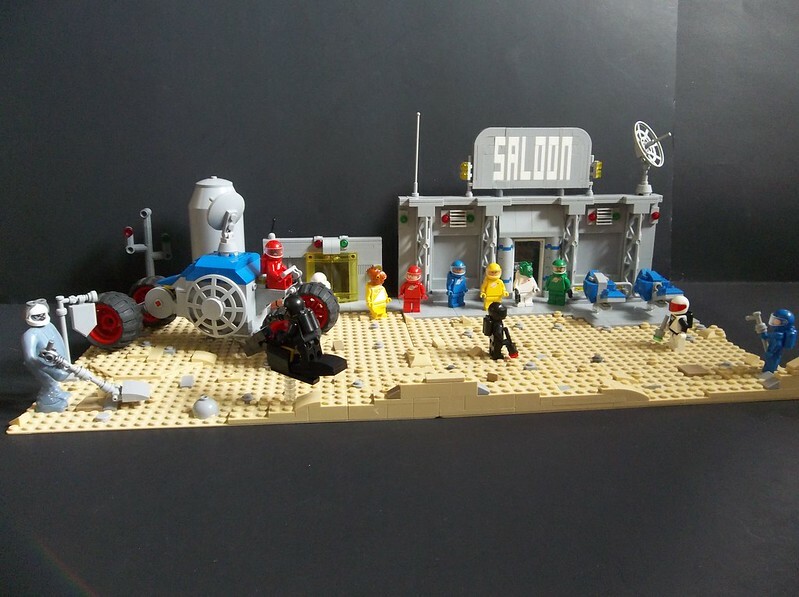 Starting with the Saloon sign and then building a façade like that in any classic spaghetti Western, I initially planned the model structured entirely around the Shootout at the Space Corral, but then the model started to get overpopulated with minifigures as I added more and more, and I realised I had to expand onto another baseplate. But the resulting two-plate creation was a bit sparse, so I had to build more stuff. This is not a problem. If I had four or five of the Gungan steeds from the Phantom Menace sets, they’d make a pretty good herd of alien cattle, but I don’t have any, let alone 4 or 5. Thus, the stagecoach rover. Building a rover that recalls a stagecoach was actually pretty fun; you don’t see too many Classic Space stagecoach rovers. I think it’s the elevated driver’s position that sells it; the rover itself isn’t all that stagecoachy otherwise. The Stagecoach rover. 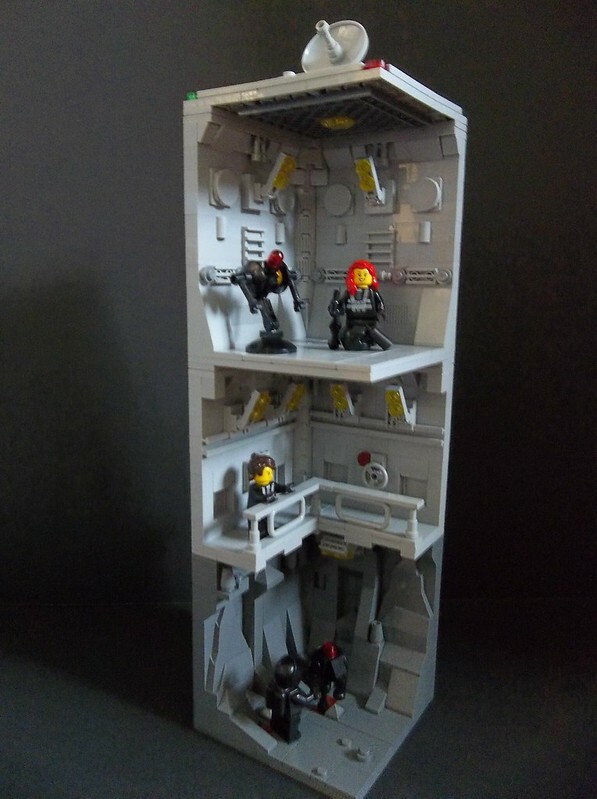 Not a great angle, unfortunately, but the overall shots give the idea. Note the alien prospector in the background. 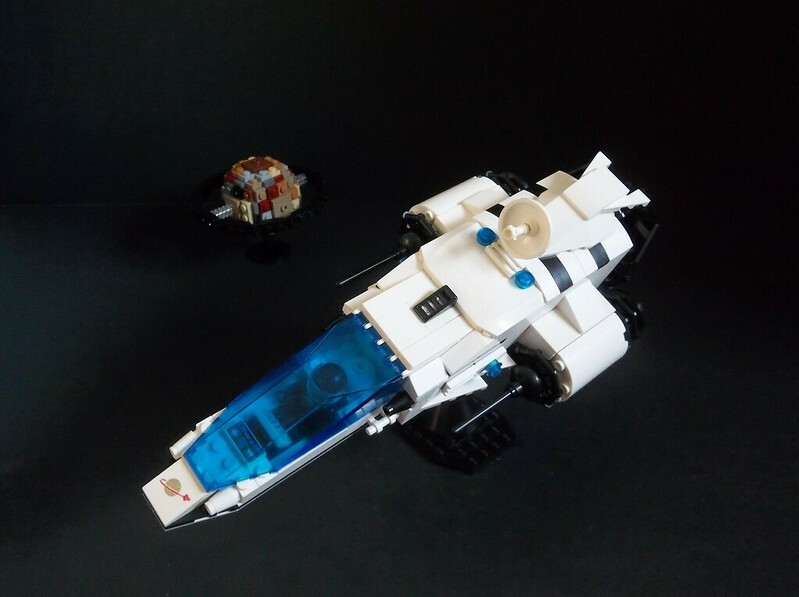 It might be fun to expand this still further and incorporate a real Space Cowboy herding Gungan steeds, but those Gungan steeds are relatively expensive for what’s basically a single brick, and I have other purchasing priorities. It’d make a pretty good display, though. I’m quite pleased with the horse speeders. 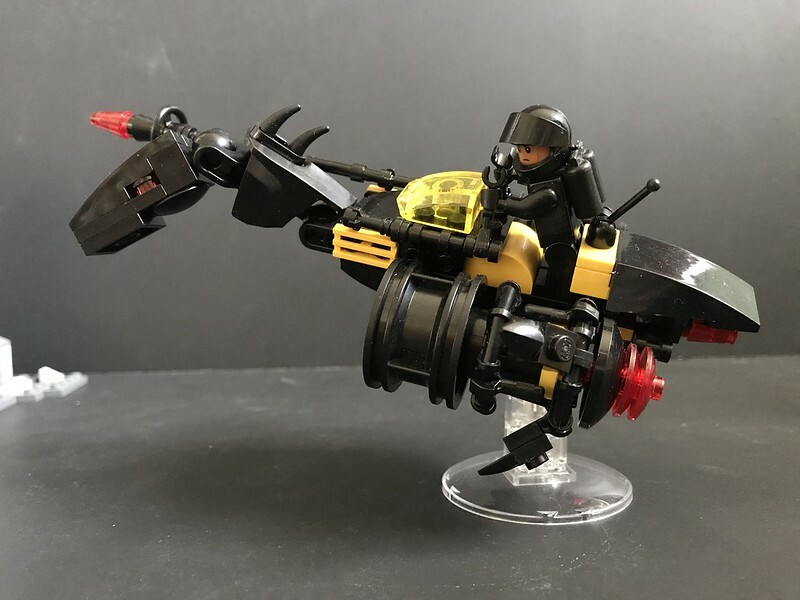 Loosely based on the Nexo Knights’ hoversteeds, they’re my own design because we only got two of the sets from that theme and neither included a hoversteed that I could adapt. Anyway, I prefer to create rather than copying whenever possible. 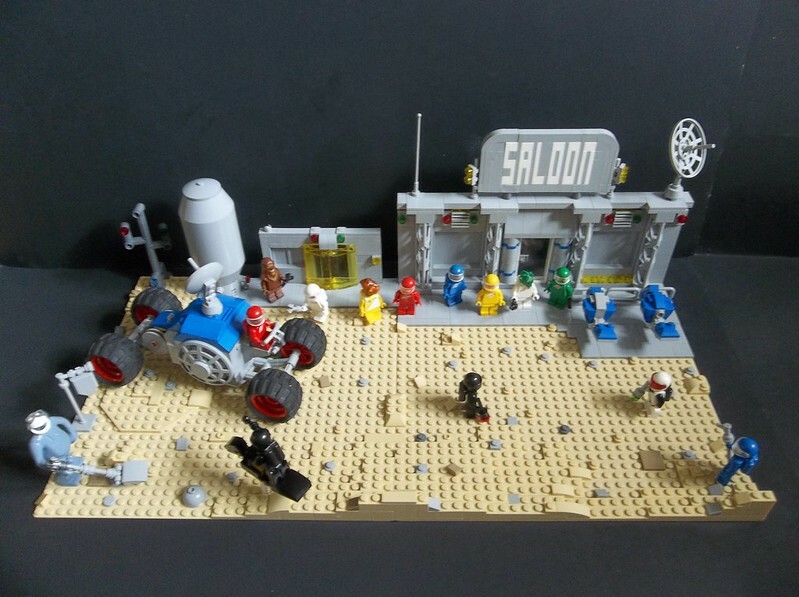 This entry was posted in Blacktron, Futuron, Lego Classic Space, Lego Space, LEGO Space Police, Space Rovers, Speeders and tagged Lego, MOC, Neoclassic Space, Space Cowboys, Western on September 6, 2018 by geoffhorswood. 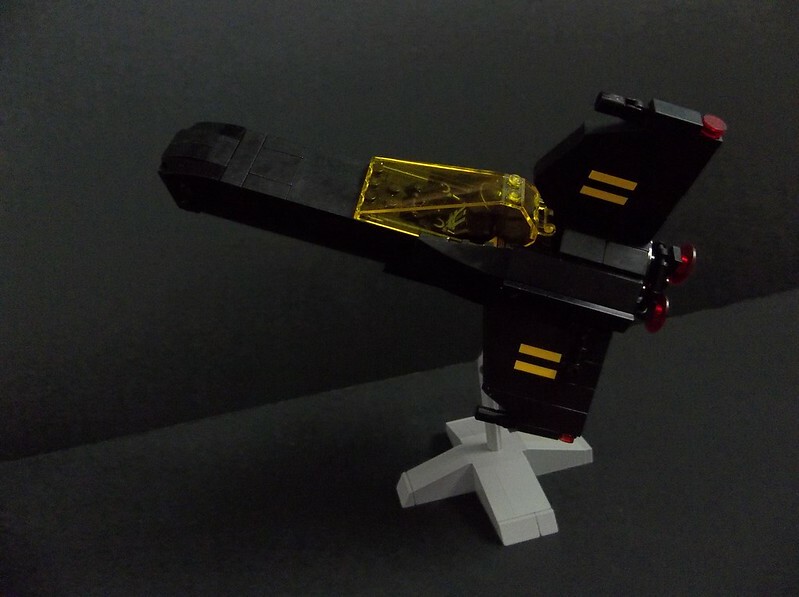 The clean, conventional lines of the Colonial Viper are most unBlacktron, really. 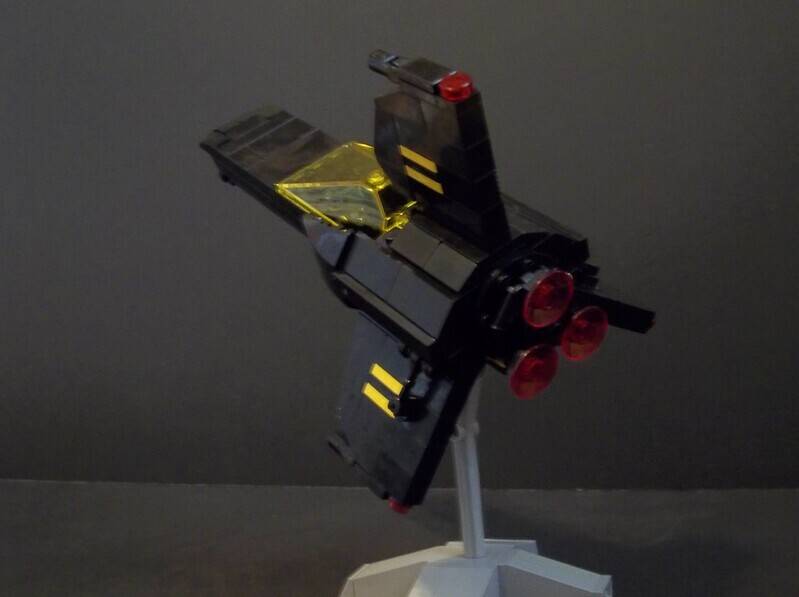 However, having built a Cylon Raider (1980s version) in Futuron colours, a Blacktron Viper does complete the symmetry. 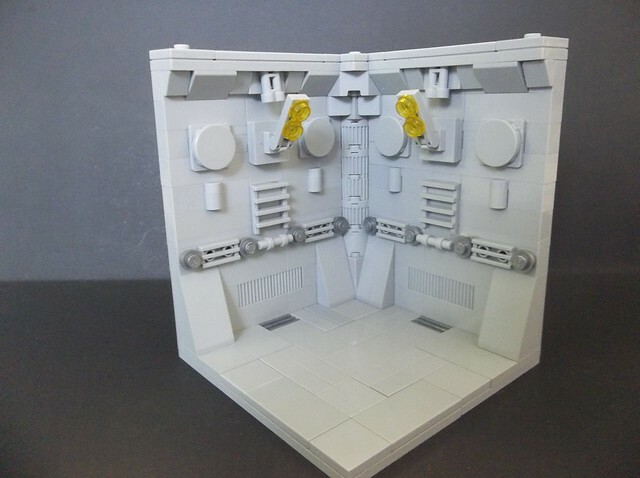 This isn’t a straight copy of the Colonial Viper, either the original version or the reboot, but like my Futuron Raider, it’s definitely in the “inspired by” category. Blacktron I hardware tends either toward the sleek and streamlined (like the Battrax) or the nastily unconventional (cue the asymmetricity of the Renegade); and while this is smooth, the shape doesn’t give quite the impression of sleekness and is certainly a very conventional, hero-type design. 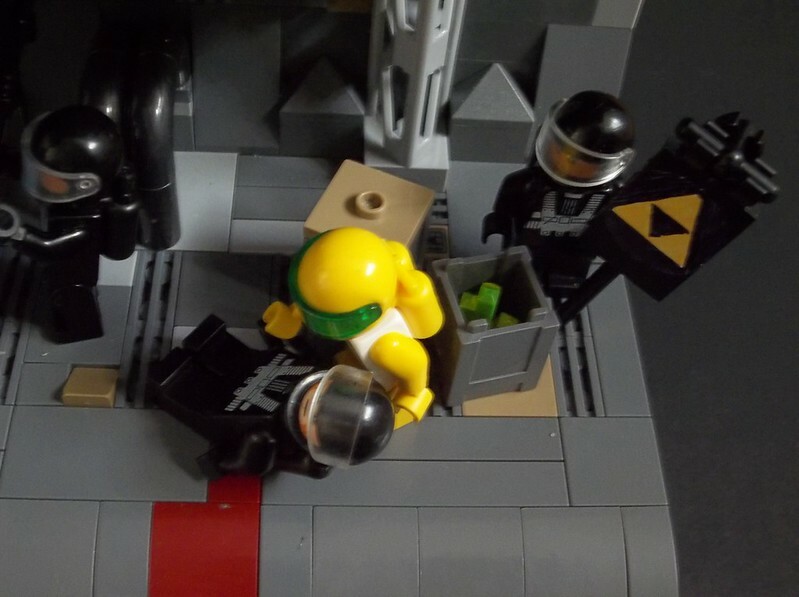 As I’ve been mentioning on this blog, in these parts at the moment the Blacktron movement is a heroic rebel Alliance rising up against the brightly-coloured tyranny of the System and its shiny Classic astronauts (frowny faces punishable by Disappearance). And in that inverse version of the Classic Space/Futuron/Blacktron shared universe, the conventionality of the Viper-esque lines make a certain amount of objective sense. Or it’s a sophisticated visual irony and the Blacktron are their usual bad selves. 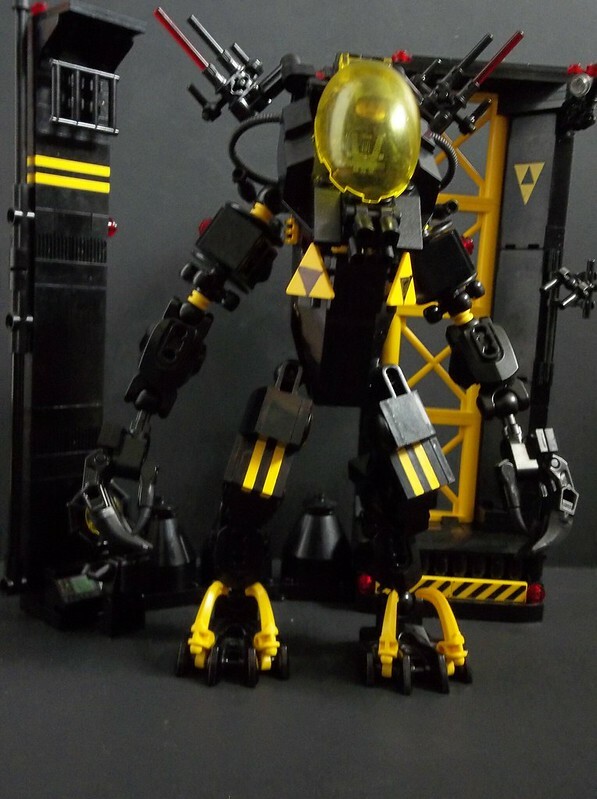 Either way, I built a Blacktron Viper to go with my Futuron Raider. And of course, I had to take a pic of them facing off. 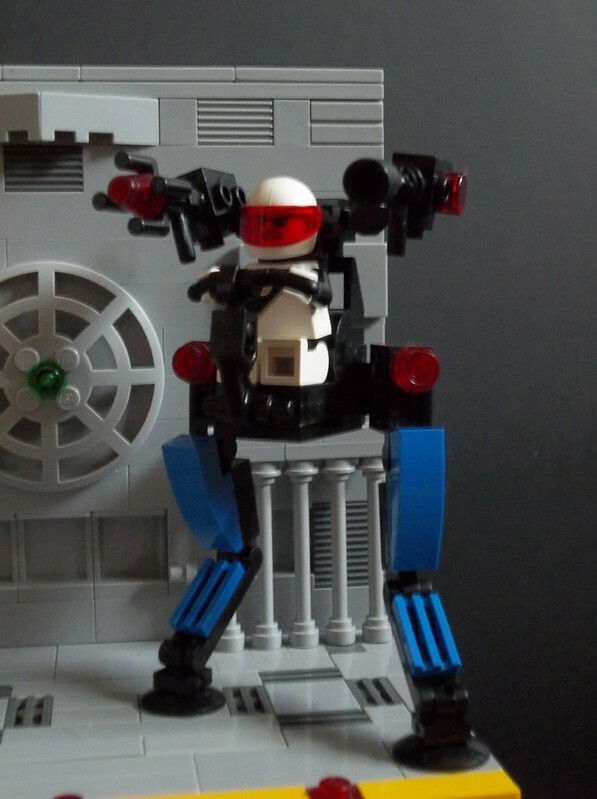 I think that with this creation I’m done with this mini Classic-Space-meets-‘80s-Battlestar-Galactica kick. 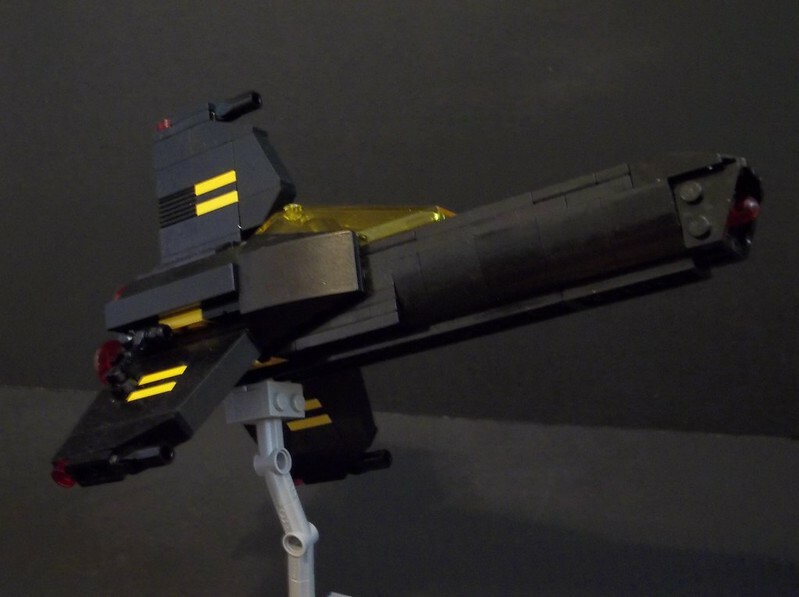 Though I do wonder whether a Blacktron Battlestar would work…? 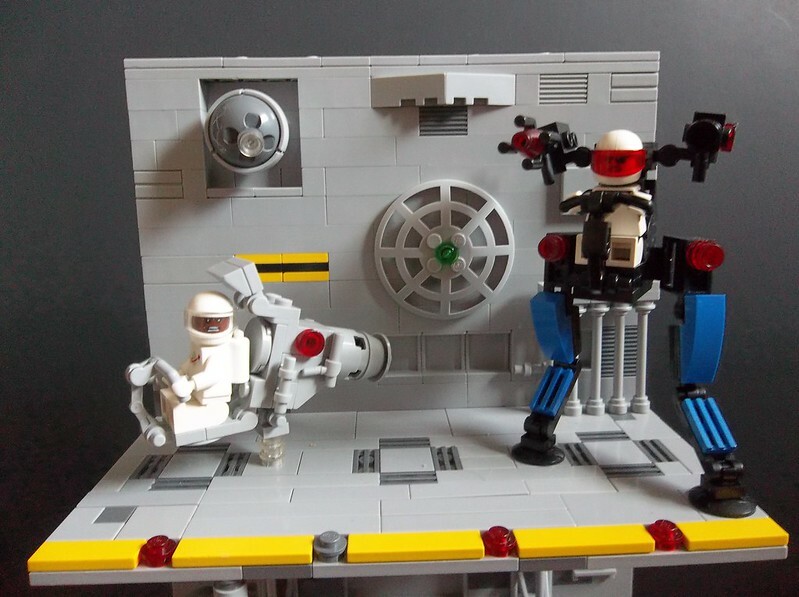 This entry was posted in Blacktron, Futuron, Lego Classic Space, Lego Space and tagged Battlestar Galactica, Blacktron, Futuron, Lego, MOC, Space fighter, Spaceship on May 16, 2018 by geoffhorswood. Blacktron bad, dark, evil, chaotic. 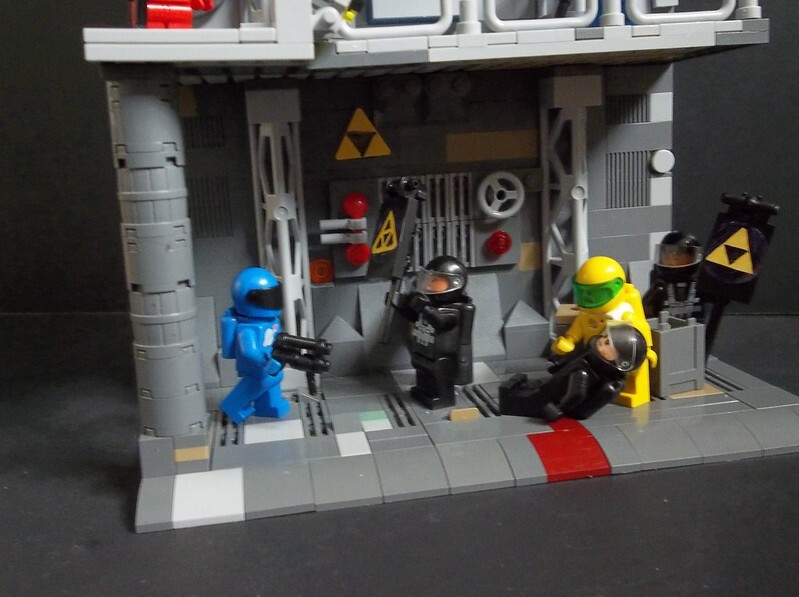 Classic Space/Futuron/Space Police good, light, ordered. 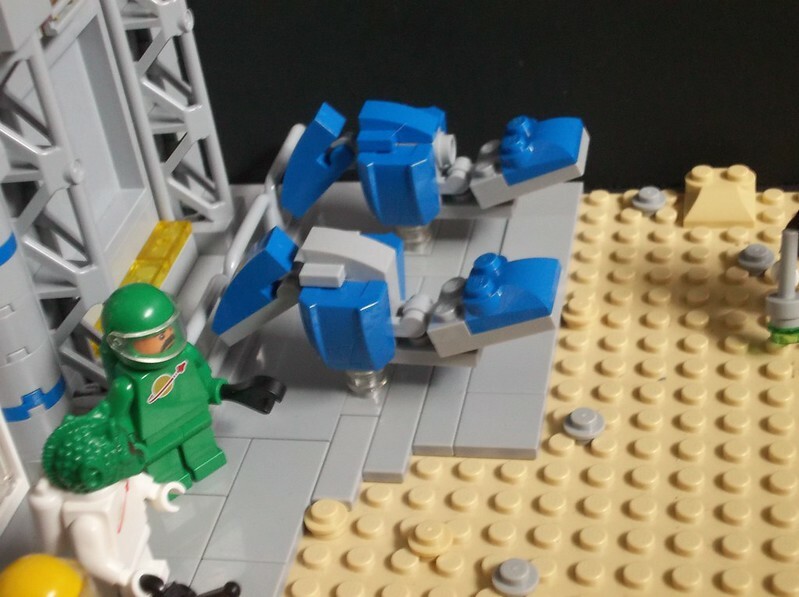 It’s pretty much standard for interpreting the (lack of) story behind the shared universe of the earliest LEGO Space themes. But what if we’re wrong? 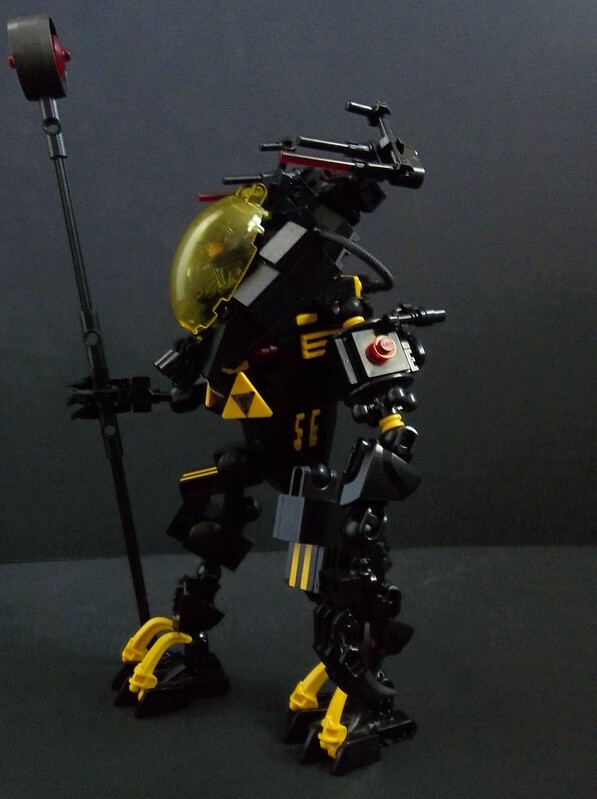 What if the Blacktron are the good guys? Yeah, they wear black and have ships with slightly sinister-sounding names like “Invader” or “Renegade”, but so what? Batman wears black. 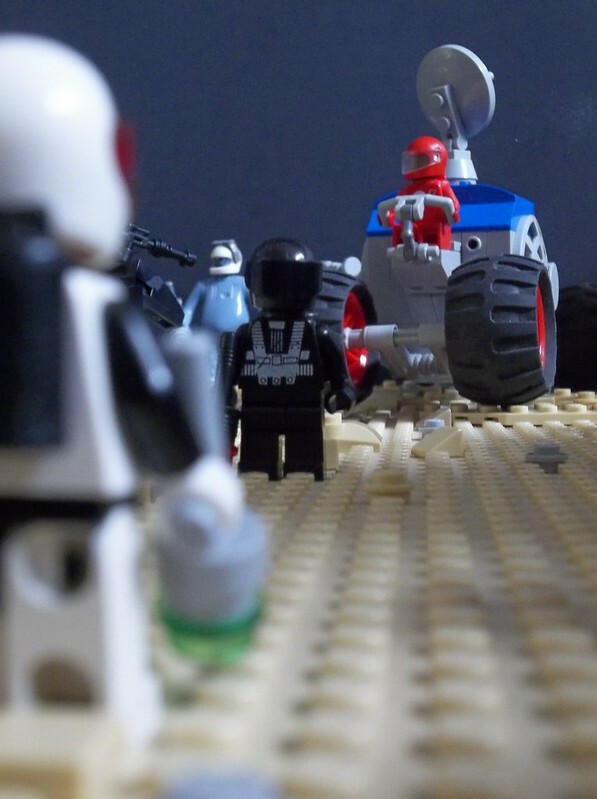 This would make the Space Police an evil instrument of tyrannical oppression, which TLG weren’t going to do back then (still probably aren’t) because they don’t want to be accused of teaching kids that regular street cops are villains. 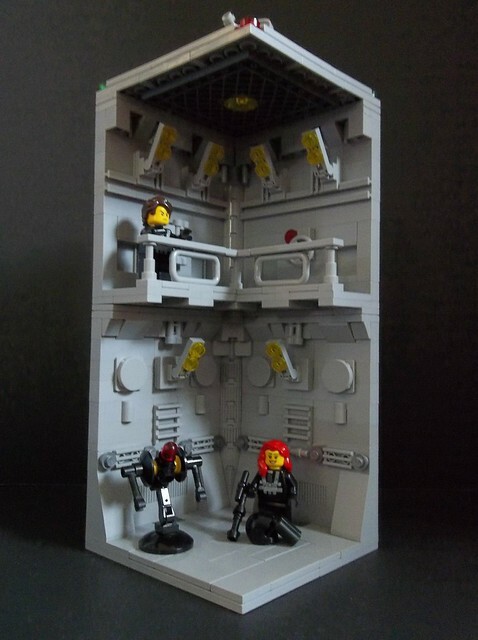 However, we’re AFOLs, and we can do things with LEGO’s products and universe that might not be completely kid-friendly and inoffensive. The idea of a tyrannical government and oppressive police force isn’t a new one and ought not to shock anyone. It’s even been used in children’s literature: CS Lewis The Lion, the Witch and the Wardrobe had the tyrant Witch Jadis’ chief wolf Maugrim be “Captain of the Imperial Secret Police”, to say nothing of more recent vintages like The Hunger Games. 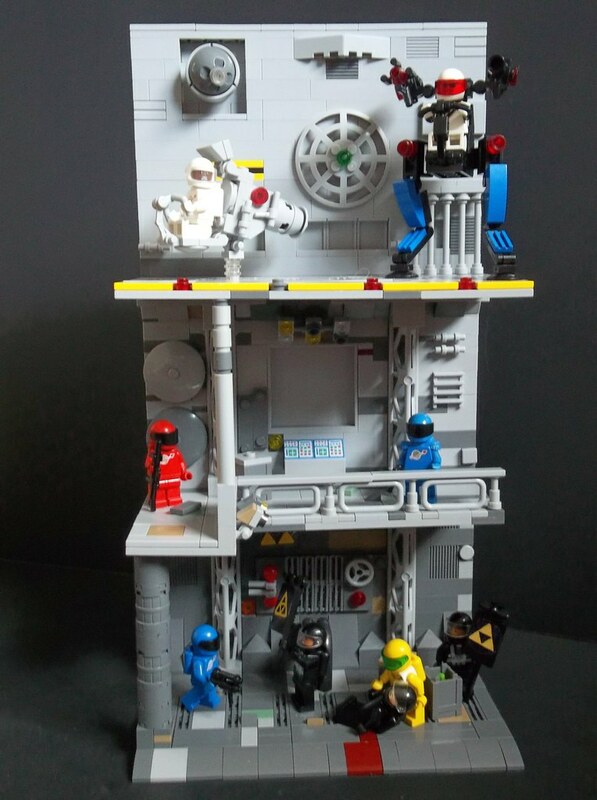 I think even quite young kids can separate out police in a story from police in real life, especially in a fantastical or futuristic setting, though I can see where a toy company like TLG making their own, non-licensed merchandise with no tie-in to a particular story might not want to go there. 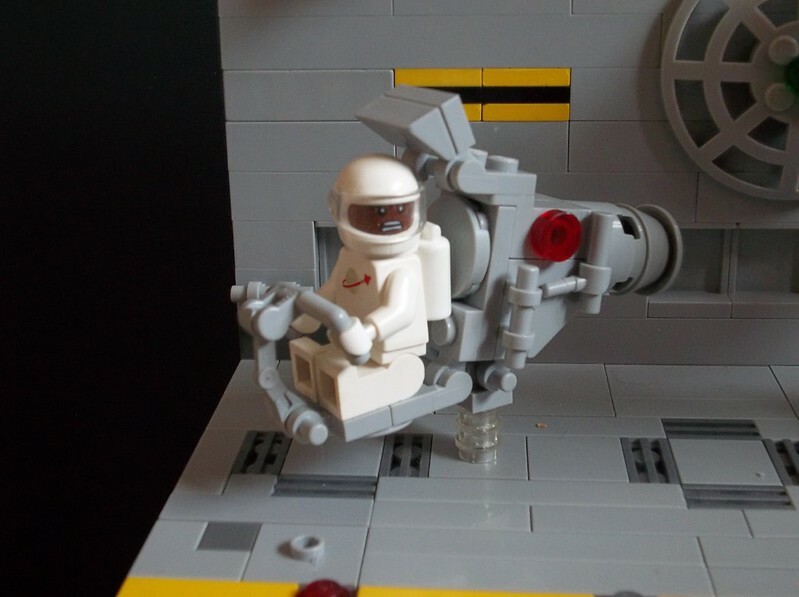 The more I looked at those old catalogue pictures and all the smiling happy faces of the astronauts, the more they looked like Lord Business’ propaganda in The LEGO Movie. Maybe it’s because I spent some time in the former Soviet Union, but I was suddenly struck by a sort of New Soviet Realism take on the old catalogue images, complete with potential sloganry: “Working Together For The Greater Good”, or “Bringing Peace To The Galaxy”, or “Be Happy; You’re In Spaaaace!”. Unhappiness punishable by disappearance. 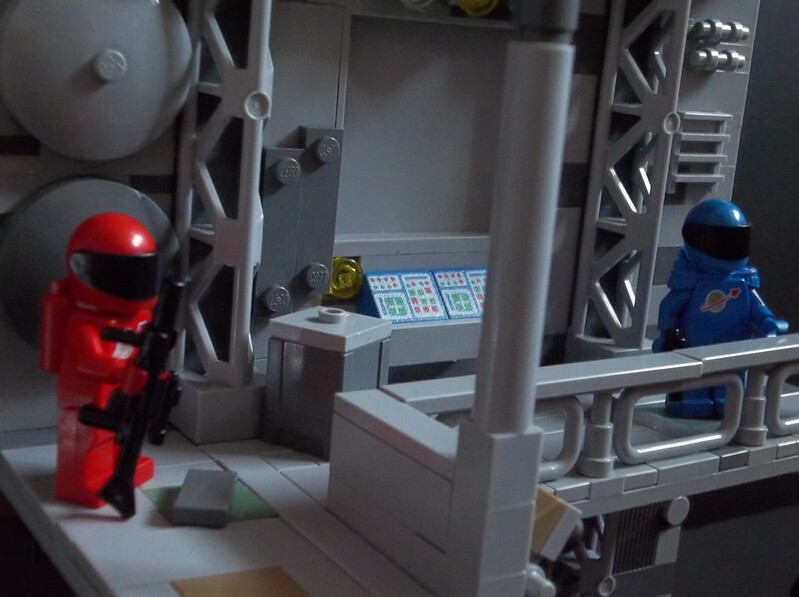 Developing the idea, I was originally going to call my Classic Space dystopia a “Federation”, inverting the moral polarity of the term that’s been adopted by fans for the Classic astronauts’ political unit ever since Reid and Goddard’s LEGO Space: Building the Future. Possibly before. But when I started thninking about how it might function and what the different suit colours represent (genetically determined caste system? ), I had an alternative idea. What if the “Federation” isn’t really a thing at all? What if the different industries that make the civilisation work are divided up between massive megacorporations run by single corporate dynasties – a sort of Ayn Randian hypercapitalism gone horribly wrong, administered by the Yakuza and the Mob, with a Soviet-esque approach to information control? Each suit colour might represent a different megacorporate First Family, with different industrial specialisms; for example the white suits might represent some kind of energy/resource extraction corporation – a TransOctan, if you will – whereas the blue suits might be an information-controlling media and communications giant – Bencom? – that manages the propaganda machine. Welcome to the transcorporate brightly-coloured tyranny of the System. In such a world, you can imagine that the Revolution picked black as a unifying colour, and countercultural, aggressive ship names that stand the shiny oppression and corporate propaganda of Dark Side rogue hypercapitalism on its head. 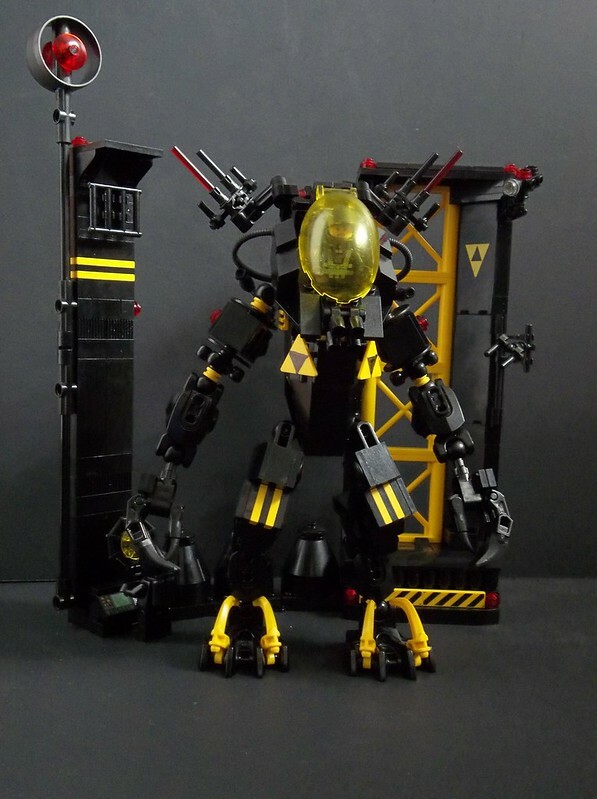 The Blacktron movement might be something akin to a political revolutionary movement – not socialism per se, because it’s the future and I’m sure they have new political movements. Like Reid and Goddard’s book, but unusually for me, all the action happens within the Solar System. 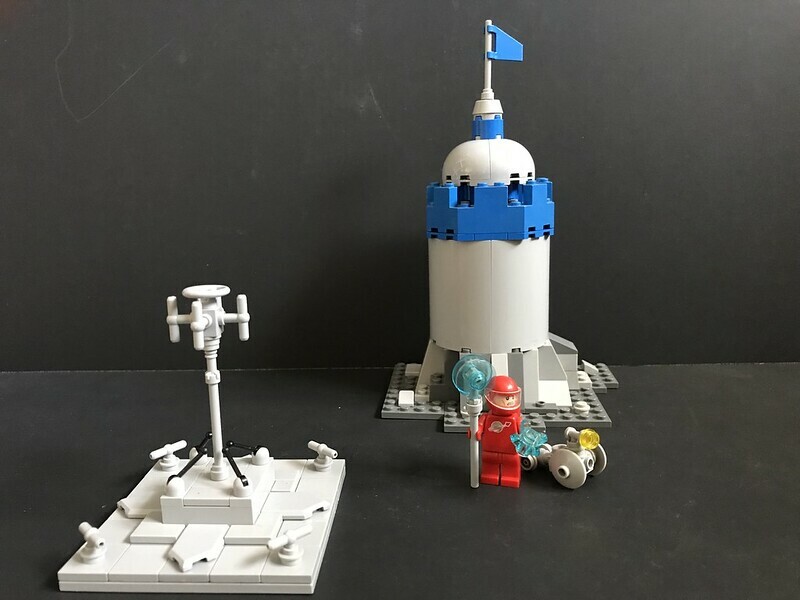 Even as a kid I usually interpreted the Classic Space theme as taking place on an interstellar level rather than merely interplanetary, but the requirements of story overrule. However, my version of the Solar System is a lot more extensively colonised, including outposts on Mercury, asteroid bases carved into the interior of Pallas, nitrogen and hydrocarbon harvesting on Titan, and of course the usual suspects on the Moon, Mars, Ganymede and in orbit. Earth has an orbital ring (which I may try to build a section of): the Bifrost Ring. 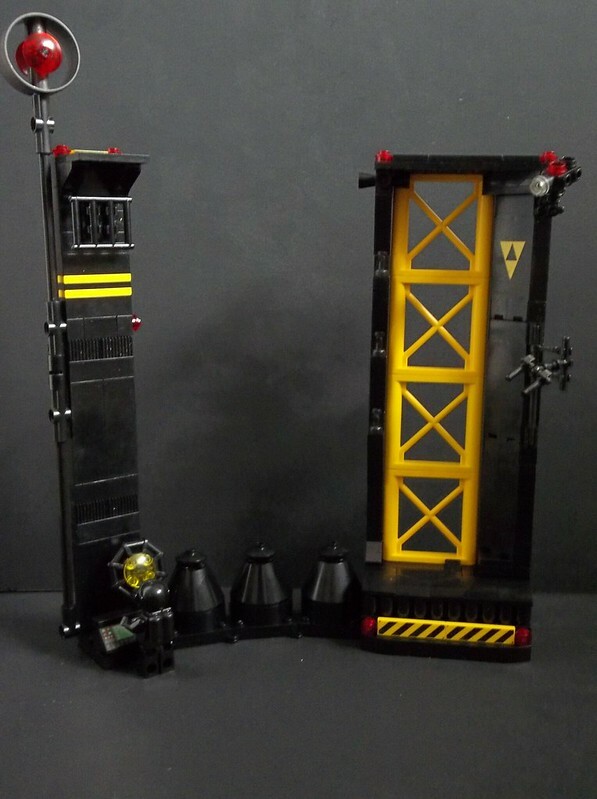 I was initially considering multiple space elevators until a friend suggested this concept, and after doing some investigations I have to say I’m sold. Massive megacorporations control everything, which is less cool, but that’s the essence of this universe. 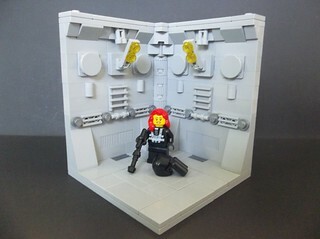 There is a rebellion in the shape of the Blacktron Alliance, because stories thrive on conflict and I’m not going to leave the future in the hands of evil corporations if I can help it. 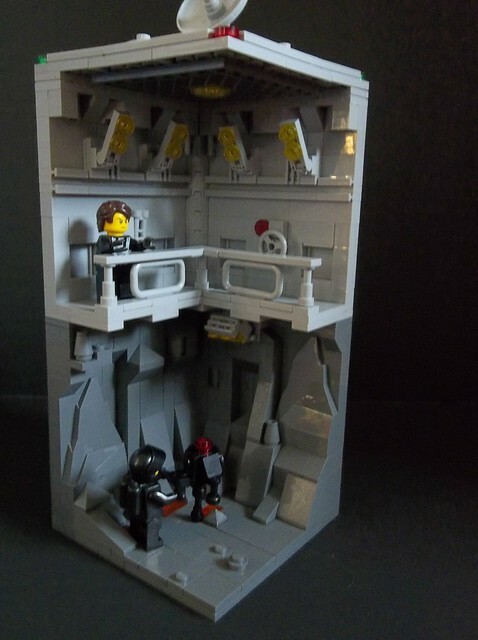 This entry was posted in Blacktron, Lego Classic Space, Lego Space, LEGO Space Police, Uncategorized and tagged Blacktron, Classic Space, Lego, Meta, MOC, Story on May 6, 2018 by geoffhorswood.